When China’s War of Resistance against Japan began in July 1937, it sparked an immediate health crisis throughout China. In the end, China not only survived the war but emerged from the trauma with a more cohesive population. 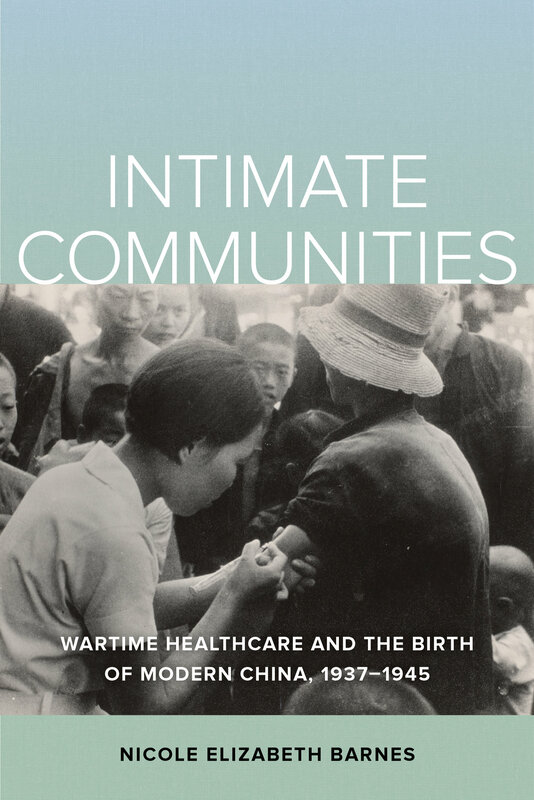 Intimate Communities argues that women who worked as military and civilian nurses, doctors, and midwives during this turbulent period built the national community, one relationship at a time. In a country with a majority illiterate, agricultural population that could not relate to urban elites’ conceptualization of nationalism, these women used their work of healing to create emotional bonds with soldiers and civilians from across the country. These bonds transcended the divides of social class, region, gender, and language. Nicole Elizabeth Barnes is Andrew W. Mellon Assistant Professor of History and Gender, Sexuality and Feminist Studies at Duke University. "Nicole Elizabeth Barnes demonstrates remarkable insights into some of the most well-known figures in health care in wartime China—and introduces many previously unknown—providing pointed character analyses while also connecting individual experiences to larger socio-political trends across the tumultuous wartime landscape. "—Sonya Grypma, PhD, RN, author of China Interrupted: Japanese Internment and the Reshaping of a Canadian Missionary Community.